Yes, I am alive and kicking. Yes, I have been (once again) missing. There are a variety of reasons, ranging from health to nothing more than apathy and I will spare you any of the boring details here. What I will say is that I am hopeful I’ll be more active over the next few weeks and months. I haven’t been able to take any photos of late but I hope to remedy that soon as well. In the meantime, I’ll post a few images of my previous Christmases in China. It’s hard for me to believe that this is already my third Christmas here. 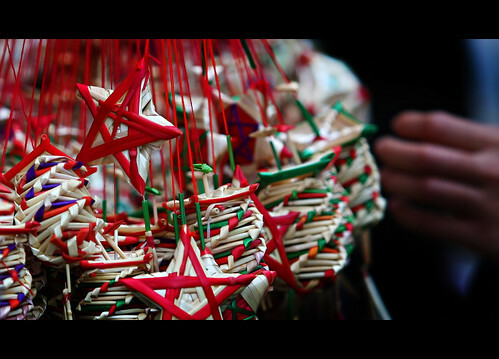 This shot is interesting to me, a Muslim man from Xinjiang Province selling straw, hand-made Christmas ornaments in South China. I remember trying to ask him if he saw any of the irony in that but my Chinese was not up to the task. Taken last year in a busy open-air marketplace here in Liuzhou. This kid is the son of a faculty member at Liuzhou Teachers College. He is performing a spirited hip-hoppish number at last year’s LTC Christmas bash. The annual show takes place this year on Monday evening. Yours truly will be performing his own hip-hoppish number (most likely with very little hop). There will be lovely back-up singers but don’t expect any photos! Trust me, know one needs to see that. I only acquiesced in the hopes that my students will see a different side of their old teacher and have a laugh. There is a Santa Claus in China. Turns out there are a lot of them as the majority are made right here in South China. In a market near my home you can find anything having to do with the business of Christmas decoration. Seriously, it’s all here, including this almost life-size saxaphone playing, dancing St. Nick. I want to say thanks to so many folks who have reached out to check on me and reassure everyone that I (finally) appear to be on the rebound. I’ll try and get out with the camera some next week and do my best to get back into the blog… Peace! ~ by Expatriate Games on December 20, 2009. No photographs? Dream on! I’m on my way armed with evidence gathering equipment! Not for you! Ms Chen in skimpy clothes! I’ve been dreaming of that for years! So glad to know you are ok. Have been missing in action myself lately. Look forward to seeing new photos and reading about your adventures in China. Good to see you’re alive and well. I check every day, wondering how you’re doing. Hope you’re New Year (even though it’s not the Chinese one yet) will be great. Looking forward to more of your great images also. All the best to you and yours. hi Michael, glad to note that you are “up and about”. just wanna wish you and your family “Happy New Year 2010”. Regards and Stay Well. I’m glad to hear that you are back and doing well. I hope that you are able to leave your health problems behind in 2009. That is what I intend to do! Best wishes for 2010. May it be filled with laughter, adventure, and tons of photography expeditions! We’re Moving – Win Great Prizes!